Wright Brothers, US Air Force Museum, Columbus, Longaberger Baskets, Scott Hagan Barn Artist, Chris Helm Fly Tying, Amish Community, Guggisberg Cheese, Lehman's "New" Old Products, Pro Football Hall of Fame, All American Soap Box Derby, Wilson Sporting Goods factory, Lake Erie's Kelley Island and Cedar Point Amusement Park. Ohio is bordered by the Allegheny Mountains to the east and the farmlands of the Great Plains to the west. A century ago, Ohio�s most famous residents, Orville and Wilber Wright, were two bicycle mechanics who ended up leaving their mark in aviation. Their shop in Dayton is now preserved by the National Park Service. In another nod to the history of flight, the United States Air Force Museum is just outside of the city. 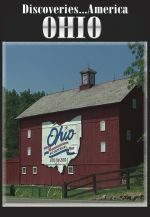 In Columbus, the state�s capital, artisans display their works at a summer arts and crafts fair while the farmer�s market in Worthington is full of produce from the area�s rich farmland. In Dresden� the world�s largest basket, which is coincidentally near the Longaberger Basket Company, a remarkable success story. Their handmade baskets are sold directly to the consumer. The factory is an incredible 20 acres in size, with more than 6000 artisans working under one roof; a fine example that �made in America� can compete on the world market. Painted barns are another facet of life in rural Ohio. Although advertising on them went out of style in the late 60s, there is still plenty of paint being applied. Scott Hagan, a local barn artist, stays busy painting everything from the state�s logo to old-fashioned quilt patterns on the sides of the old barns. Another Ohio artist, Chris Helm, is one of the world�s foremost fly tying experts. He creates flies that are almost too good to fish with. One of his creations takes more than five hours to complete and sells for more than one hundred dollars. In the rolling hills of central Ohio�the largest population of Amish people in the world. From farming to fine woodworking, they�re a rich part of the regional culture. Originally catering to the Amish population, Lehmans is a remarkable store. From butter churns to oil lamps, all of their products are modern day descendants of the original items that anyone could have purchased around the turn of the century. Football is huge in Ohio. In Canton, the Professional Football Hall of Fame is a monument and a museum, a facility with an inspired collection of memorabilia charting the growth of the game over the years and enshrining its greatest players. In Ada, the Wilson Sporting Goods Company has manufactured a variety of balls for different sports over the years, but their leather footballs are what they are best known for. The All American Soapbox Derby is headquartered in Akron. The annual finals race draws thousands of competitors from across the country, kids of all ages who come to compete in an American tradition. Their museum has a collection of winner�s cars going back to the beginning of the races in the 30s. Up north on the shore of Lake Erie, Cedar Point, one of the largest amusement parks in the world with a number of record setting roller coasters.